Saido Berahino missed a stoppage-time penalty as Blackburn Rovers survived a spirited Stoke City comeback to inflict a fourth defeat of the season on Gary Rowett's side. Berahino, who had earlier scored his first league goal since February 2016, struck the bar from the spot after he had been fouled by Darragh Lenihan. Rowett said after the game that he "did not want to be critical" of Berahino, but that "if you pick the ball up and you take that responsibility of course your responsibility is to score it". "We've done so much work in the last three or four weeks on our defending," he told BBC Radio Stoke. "We actually do it quite well in training, and then as soon as the whistle's blown for some reason we make the same mistakes." 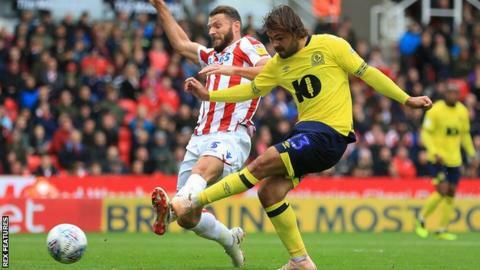 Rovers had led when Bradley Dack was left unchallenged to convert from close range, before Elliott Bennett's long ball beat Stoke's backline and let Danny Graham double the advantage. The hosts were booed off at the break and Harrison Reed, on loan from Southampton, made it three on his first Blackburn start early in the second half after fine work from Bennett and Graham. Stoke rallied through Berahino's bundled effort and Tom Ince's close-range finish - but fell short of finding an equaliser despite mustering 17 attempts on goal. Substitute Peter Crouch had a shot cleared off the line, before Berahino wasted their big chance from the penalty spot in the first minute of time added on. Rowett's men, relegated from the Premier League last season, are now 18th in the table and have the Championship's joint second worst defensive record, having conceded 16 goals so far. Blackburn only had four shots on target in the contest but were clinical with their finishing and have moved up to 11th. Tony Mowbray's side are unbeaten in three having won promotion from League One in May. "Goals change games and from being 3-0 up and being totally dominant in the game, and really should have been 4-0 up, to clinging on for our lives otherwise it would have been another two dropped point. "I'm not being critical with them, it is young players knowing how to see games out. I think the first goal, from the crowd being against the team to driving them on and us really feeling as if we were playing against a Premier League side with them cheering the side on. "It's what we worked so hard for last year and I'm delighted that we got the three points." Match ends, Stoke City 2, Blackburn Rovers 3. Second Half ends, Stoke City 2, Blackburn Rovers 3. Elliott Bennett (Blackburn Rovers) is shown the yellow card for a bad foul. Erik Pieters (Stoke City) wins a free kick in the attacking half. Foul by Elliott Bennett (Blackburn Rovers). Peter Etebo (Stoke City) wins a free kick in the defensive half. Foul by Ryan Nyambe (Blackburn Rovers). Ben Brereton (Blackburn Rovers) wins a free kick in the attacking half. Corner, Stoke City. Conceded by Ryan Nyambe. Penalty missed! Still Stoke City 2, Blackburn Rovers 3. Saido Berahino (Stoke City) hits the bar with a right footed shot. Penalty Stoke City. Saido Berahino draws a foul in the penalty area. Penalty conceded by Darragh Lenihan (Blackburn Rovers) after a foul in the penalty area. Substitution, Stoke City. Bojan replaces Bruno Martins Indi. Delay in match Ben Brereton (Blackburn Rovers) because of an injury. Joe Rothwell (Blackburn Rovers) wins a free kick in the attacking half. Offside, Stoke City. Joe Allen tries a through ball, but Tom Ince is caught offside. Substitution, Blackburn Rovers. Adam Armstrong replaces Danny Graham. Substitution, Blackburn Rovers. Ben Brereton replaces Bradley Dack because of an injury. Delay in match Bradley Dack (Blackburn Rovers) because of an injury. Attempt missed. Joe Allen (Stoke City) right footed shot from outside the box misses to the right. Assisted by Ryan Shawcross. Attempt saved. Peter Crouch (Stoke City) header from very close range is saved in the bottom left corner. Assisted by Peter Etebo. Goal! Stoke City 2, Blackburn Rovers 3. Tom Ince (Stoke City) left footed shot from the centre of the box to the bottom right corner. Assisted by Saido Berahino. Substitution, Blackburn Rovers. Joe Rothwell replaces Harrison Reed. Goal! Stoke City 1, Blackburn Rovers 3. Saido Berahino (Stoke City) with an attempt from very close range to the bottom left corner. Assisted by Peter Crouch with a headed pass. Hand ball by Saido Berahino (Stoke City). Attempt blocked. Saido Berahino (Stoke City) left footed shot from the centre of the box is blocked. Assisted by Peter Etebo. Peter Crouch (Stoke City) wins a free kick in the defensive half. Foul by Danny Graham (Blackburn Rovers). Foul by Bruno Martins Indi (Stoke City). Richard Smallwood (Blackburn Rovers) wins a free kick on the right wing. Attempt missed. Peter Crouch (Stoke City) header from the right side of the box is close, but misses to the right. Assisted by Ryan Woods. Cuco Martina (Stoke City) wins a free kick in the defensive half. Bradley Dack (Blackburn Rovers) wins a free kick in the attacking half. Cuco Martina (Stoke City) is shown the yellow card for a bad foul. Which players have given Jamie Johnson advice over the years?